Wait just a second here. I enjoy (most of the time) taking my children out to lunch and dinner with my husband or friends. Our children, and our friend's children, are very well behaved. Yes, Andy has his moments, but it is nothing that Thomas the Tank Engine or a lollipop won't fix. If he is screaming bloody freaking murder, then, yes, it is obviously time to go. But, those parents who just don't have any common sense and let their kids run wild, scream and pitch a fit are giving all of us parents a bad reputation. Not only has an airline banned kids from certain sections (ok, but who is paying for 1st class anyway? ), but the movie theaters and some restaurants are getting on the bandwagon, too. But can I just say...look at the people in this picture who are thrilled about the ban on kids. Shocker. 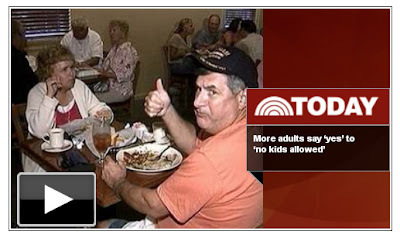 They are a bunch of grumpy old folks who probably don't have grandkids of their own. Who wants to dine with them anyway? Again, if your kid is flipping out, leave. It obviously is not a good day for the little one. Don't put him/her through that. Try again a different day. My mom always told me that if you want children to behave while you are out, then you have to take them out and expose them to that experience. Otherwise, they don't know how to act. That's what I always have done. I took Andy out when he was 2 weeks old. He may have been asleep most of the time then, but it was still a learning experience for me as a new mom. But, how are new mommies supposed to do that if everyone keeps banning kids? What do you do when your kid flips out in public? What do you think of this new ban trend? I've been thinking about this post. I do think there are times when it's nice to have some kid free time, however, if banning children becomes the norm that would be really bad. We parents do need to take responsibility for teaching our children good behavior, or responding when their behaviors not good. But ... I also know what it's like to be caught in a situation I wasn't planning on. I was just on a flight where a young child was crying the entire time. That kind of thing doesn't really bother me. I think I've developed the ability to block out annoying circumstances. But I can see how some people might not want to deal with it. The little one on the flight was about 9 months old, and you just know her little ears probably felt like they were going to burst~ poor thing! I'm not sure what the answer is?!? Oh, I forgot to mention that I saw your cute button and added it to my friends page. It's very cute!